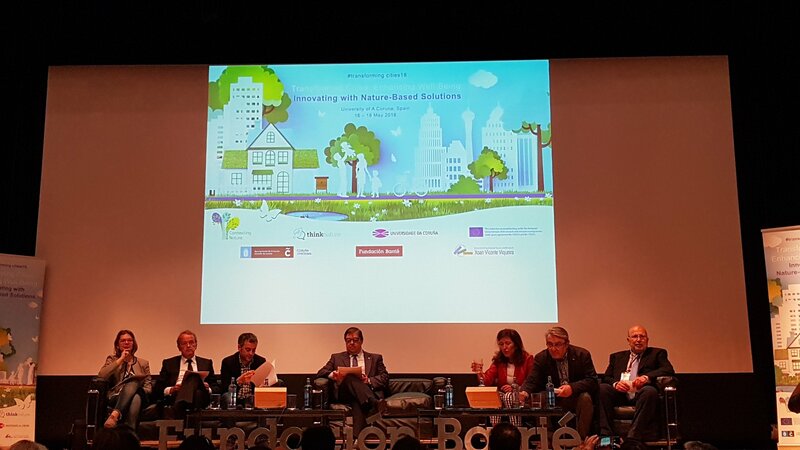 El Rector de la UDC, Julio Abalde, la Conselleira de Medio Ambiente Beatriz Mato y el Alcalde de A Coruña, Xulio Ferreiro, inauguraron el simposio, junto con los organizadores, Adina Dumitru y Ricardo García Mira. Más de 20 ciudades presentarán sus experiencias para la mejora de la calidad de vida de la ciudadanía a través de la puesta en marcha de infraestructuras verdes y soluciones basadas en la Naturaleza. Representantes de Paris, Londres, Copenhaguen o Bolonia compartirán experiencias con A Coruña o Santiago de Compostela. Las sesiones plenarias de las mañanas del 16, 17 y 18 de mayo están abiertas gratuitamente al público y contarán con traducción simultánea Inglés-Galego. Picture: TRANSIT Final Conference. Rotterdam, September 2017. One of the most exciting insigths draw from the TRANSIT- A Theory for Transformative Social Innovation- project I was involved in the last four years is the “Manifesto for Transformative Social Innovation”, which was produced by the TRANSIT researchers together with activists and practitioners, policymakers and many people involved in the activity developed in the TRANSIT project. The aim of this “manifesto ‘in-the-making’ on transformative social innovation towards more sustainable, just and resilient societies” is to unite those people, to identify complementarities, differences, common insights and challenges. To this end, this manifesto also deliberates what we mean by ‘transformative’ and ‘social’ innovation, what it has to offer and what sets it apart from other types of change or innovation. The purpose of doing so is to formulate a common call for action to create focus and momentum for collaboration. “An age of contradiction is upon us. People and nature are more globally interconnected than ever before, while also increasingly separated by old and new divisions. Scientific knowledge, technological innovation and legal structures have brought progress and previously unimaginable forms of comfort and entertainment. At the same time, there is severe poverty and inequality, ecological disasters, climate change, biodiversity loss and economic downfalls. The past years have been full of political turmoil over increasing divides in society, manifested in intercultural tensions, ‘post-truth’ media wars, and unprecedented protests and demonstrations. (…). We are writing this manifesto as people who participate, study and support such movements. While they may seem invisible or marginal to many, these communities implement social change everywhere across the globe in neighbourhoods, cities, and rural areas. From community energy initiatives, basic income experiments, cooperative banks and participatory budgeting, to ecovillages, co-working spaces, digital fabrication workshops, sharing platforms, agriculture cooperatives, urban labs and many more (find more examples here). These social innovations are changing social relations, leading to new ways of doing, thinking and organizing, and aiming towards a world based on ecological and human values, nurturing the commons and treasuring basic human rights and democracy”. 1. Physical and mental space for learning and experimentation is a necessary condition. 2. We require alternative and diverse economies. 3. Innovation is just as much about shaping the new as it is about reframing the old. 4. We need to experiment with alternative social relations and relational values. 5. Social & material change are intertwined: we need both social & technological innovation. 6. Transformative change requires hybrid combinations of civil society, state and market. 7. Social innovation should never be an excuse to dismantle necessary public services. 8. Translocal empowerment is a promising response to the challenges of globalisation. 9. Social innovation is about fostering a sense of belonging, autonomy and competence. 10. Transparent and inclusive decision-making is a necessary condition for change. 11. Alternative and diverse narratives are needed to drive change. 12. More mutual recognition and strategic collaboration is needed. 13. Embracing paradoxes is key to transformative social innovation. The MANIFESTO claims “the right to innovate and foster transformative social change” as well as calls a wider commitment to collaborative action. Thus, the manifesto calls to activists, researchers, policymakers and everyone to contribute, to embrace participatory decision-making and “to be appreciative, curious, and passionate”. 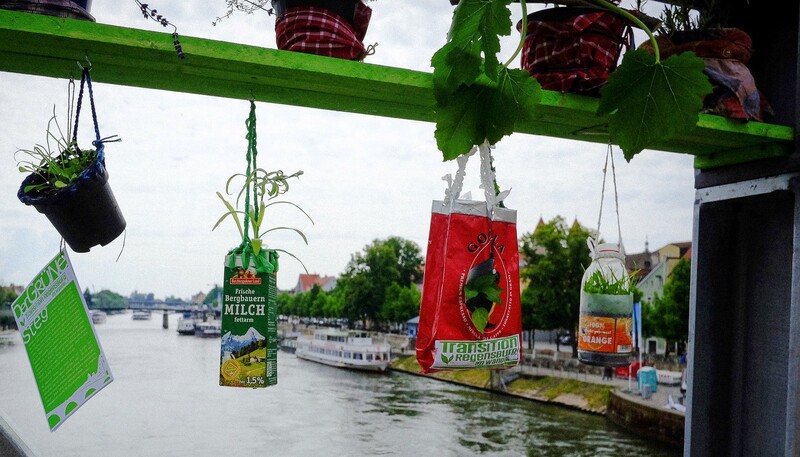 This 4th TRANSIT brief, authored by Adina Dumitru, Isabel Lema-Blanco and colleagues, offers insights into the following questions: what is social learning, what does it consist of in the case of SI initiatives, and why is social learning important – even foundational – for SI initiatives as well as wider society? Because social innovation initiatives experiment with radically different ways of doing things and have ambitions to achieve change in society, social learning is of paramount importance. Through experimentation with new social relations, interaction and conscious reflection, members of SI initiatives learn about how to develop, thrive and engage in effective strategies for transforming existing practices and institutions. They develop ways of relating to one another that are more fulfilling, and strategies for interacting with existing institutions, practices and relations of power. When such insights, strategies and the underlying values become shared, we speak of social learning. Social innovations become transformative when they challenge, alter, replace or produce alternatives to well-established social relations, and ways of doing things. In their journeys, social innovations are subject to pressures for change themselves. They thus need to learn how to maintain autonomy and integrity and resist capture, especially from government and other powerful actors. Social learning in transformative social innovations will be illustrated with empirical examples from the following three (TRANSIT) cases: slow food, credit unions & financial cooperatives and ecovillages. 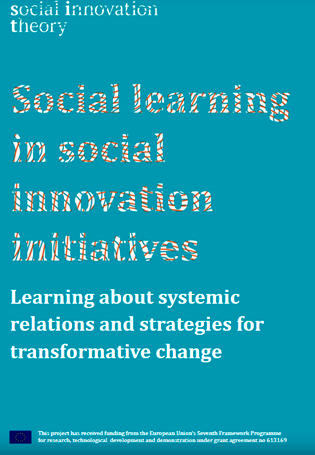 Dumitru, A., Lema-Blanco, I., Kunze, I., Kemp, R., Wittmayer, J., Haxeltine, A., García-Mira, R., Zuijderwijk, L. and Cozan, S. (2017) Social learning in social innovation initiatives : learning about systemic relations and strategies for transformative change (TRANSIT Brief ; 4), TRANSIT: EU SHH.2013.3.2-1 Grant agreement no: 613169. TRANSIT (TRANsformative Social Innovation Theory) is an ambitious research project that will develop a theory of transformative social innovation which is about empowerment and change in society. It is co-funded by the European Commission and runs for four years, from January 2014 until December 2017. TRANSIT will utilize a research method which encourages feedback from social entrepreneurs and innovators, policy makers and academics to develop a theory with practical relevance. The research project studies how social innovation can bring about empowerment and societal transformation. The theory of Transformative Social Innovation will be formulated in a dynamic and iterative process that builds on existing theory, grounds the emerging theory in in-depth case studies and tests it through a meta-analysis of survey data.An embedded case study approach is used to ground and test the emerging middle-range theory on transformative social innovation. This approach combines both qualitative, in-depth case study analysis, as well as quali-quantitative comparative meta-analysis. In total, TRANSIT researches a sample of approx. 20 transnational networks. Further outputs of this process include working papers, training tools, policy and practice briefs for social innovators, entrepreneurs, researchers, and policymakers. It has been a pleasure to receive the confirmation that my paper, titled “The role of grassroots innovations in promoting local sustainable consumption. Motivations, values and learning outcomes within the “Galician network of conscious and responsible consumption” has been accepted to be presented at the International Conference on Environmental Psychology: “Theories of change and social innovation in transitions towards sustainability” to be held in A Coruña (Spain), next 30th ,31st of August and 1st of September ,2017. Beyond my session, I would like to mention that the programme of the conference includes 23 Symposia, more than 170 paper presentations and 44 posters. Besides, a remarkable representation of the best researchers and experts in environmental psychology will participate in the different sessions to be held during the conference. The ICEP 2017 will start on wednesday 30th August with the introductory talk “Promoting sustainable lifestyles, social innovation and wellbeing in Europe: lessons from three large-scale interdisciplinary projects” by Prof. Ricardo Garcia-Mira & Dr. Adina Dumitru. Richard Wener. Lecture: Can Detention Be Humane and Sustainable? This international symposium is being organized by the IAAP (International Association of Applied Psychology), Division of Environmental Psychology with the collaboration of the People Environment Research Group – Department of Psychology. University of A Coruña (Spain). Este WORKING PAPER, elaborado por el consorcio TRANSIT, presenta análisis del fenómeno de agencia en las dinámicas de innovación social transformadora a partir de las reflexiones extraídas de los resultados empíricos de 20 estudios de caso desarrollados en Europa y América en 2014 y 2015. Este documento se ha elaborado como parte de un proyecto de investigación financiado por la UE titulado “TRANsformative Social Innovation Theory” (TRANSIT, 2014-2017). Las proposiciones recogidas en este documento representan los primeros pasos de TRANSIT hacia el desarrollo de una nueva teoría de la Innovación Social Transformadora, tomando la forma de protoexplicaciones de la agencia y la dinámica de la innovación social transformadora, sobre la base de comparar nuestros resultados empíricos con el estado del arte y los marcos teóricos del proyecto. El marco teórico de ste trabajo se basa en los estudios de las transiciones hacia sostenibilidad, la investigación de innovación social, estudios de psicología social de empoderamiento y otras varias áreas de la teoría social. La última semana de noviembre, los días 30/11 y 1/12 nos reuniremos en Bruselas más de un centenar de investigadores, activistas sociales, políticos y técnicos de la Comisión Europea, para presentar y discutir los resultados del proyecto GLAMURS (SUPPORTING GREEN LIFESTYLES). que ha sido coordinado por el grupo de investigación Persona-Ambiente de la Universidade da Coruña. En la Conferencia Final contaremos con la presencia de expertos y activistas de las iniciativas estudiadas, como el Profesor Tim Kasser, líder en la investigación sobre aspiraciones intrínsecas, el valor del tiempo y su relación con el bienestar y con comportamientos más ecológicos; Nina Treu de la Red Alemana de Decrecimiento o Claudian Dobos, fundador de la eco-aldea Aurora y Presidente de ECOLISE (European Network for Community-led initiatives on Climate Change and Sustainability). Además, contaremos con la presencia de varios miembros del Parlamento Europeo, decisores de nivel nacional y europeo, e investigadores de otros proyectos europeos. El objetivo general de GLAMURS es comprender los caminos para las transiciones hacia una economía verde en Europa. Un objetivo fundamental del proyecto consiste en identificar cómo los estilos de vida europeos pueden cambiar en una dirección sostenible y qué tipos de modelos de transición necesitan ser apoyadas. Para este propósito, GLAMURS propone una reflexión crítica sobre los aspectos básicos y las definiciones generales del concepto de “Estilos de Vida Sostenibles”, y en segundo lugar, estudiar los estilos de vida sostenibles e identificar los principales impulsores -individuales y sociales- de una transición hacia estilos de vida sostenibles. Teorías e investigaciones empíricas realizadas hasta ahora sobre actitudes medioambientales y comportamiento ambiental, consumo verde y conservación de los recursos ofrecen una base sólida para comprender “qué constituye un estilo de vida sostenible” y que se estrategias se deben seguir para su promoción. Explorando las determinaciones de estilo de vida. Glamurs explora las interacciones complejas entre factores económicos, sociales, culturales, políticos y tecnológicos que influyen en estilos de vida sostenibles y transformaciones hacia una economía verde. Desarrollo de modelos de transición. Glamurs desarrolla modelos completos de cambios de estilo de vida en dominios claves de la sostenibilidad, y los evalúa en términos de efectos económicos y ambientales. Recomendaciones políticas. Glamurs proporciona recomendaciones de política sobre el diseño de posibles enfoques de gobernabilidad y mezclas de políticas para una transición acelerada hacia la sostenibilidad. Un enfoque multi-método. Glamurs combina métodos en toda la amplitud de las ciencias sociales, incluyendo psicología, sociología, micro y macroeconomía y modelado basado en agentes. Co-producción del conocimiento. GLAMURS integra los puntos de vista de las partes interesadas, los responsables políticos, los empresarios y los pioneros verdes mediante el uso de métodos de coproducción del conocimiento y desarrolla un vocabulario y una gramática integrados para su equipo de investigación inter y transdisciplinario. 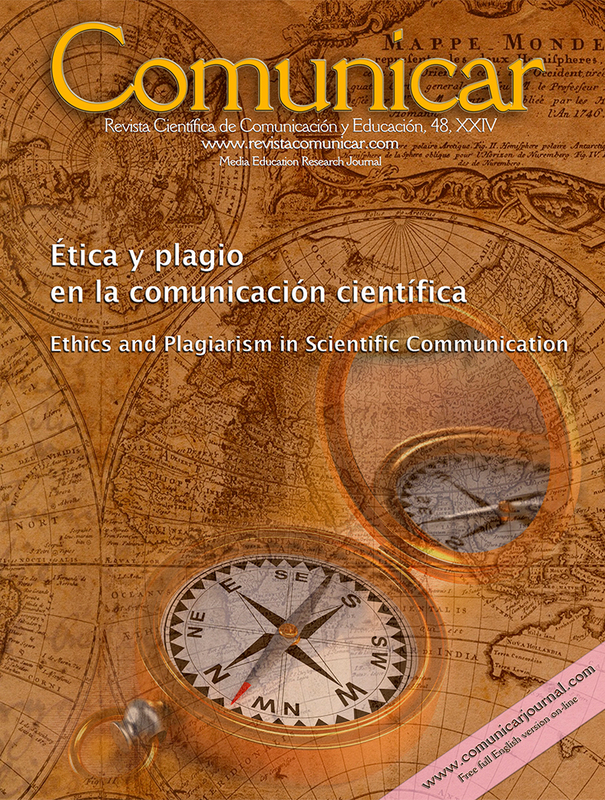 La revista COMUNICAR acaba de publicar, en su número 48, un artículo elaborado por Isabel Lema Blanco, Eduardo Rodríguez y Alejandro Barranquero, titulado “Jóvenes y tercer sector de medios en España: Formación en comunicación y cambio social” y que muestra parte de los resultados del proyecto “Los jóvenes y el tercer sector de la comunicación en España”. Este trabajo tiene por objeto acercarse al papel de los medios comunitarios, libres y universitarios del Estado español como instrumentos para la alfabetización mediática y en tanto que espacios para la conformación de ciudadanía crítica y comunicativa.Tras el apartado conceptual, se analizan los procesos de aprendizaje que se implementan con respecto a la ciudadanía en general y a las comunidades de referencia en particular, prestando especial atención al rol y a la participación de la juventud. A partir de la triangulación de técnicas cuantitativas (encuesta) y cualitativas (grupos de discusión), los resultados demuestran que los medios del tercer sector actúan como valiosas herramientas para la adquisición de habilidades y competencias críticas que pueden transferirse a la esfera profesional y vivencial de los jóvenes, dada la identificación de estos medios con los intereses, problemáticas y aspiraciones juveniles. En un sentido amplio, estas iniciativas contribuyen a la expansión del derecho a la comunicación en dos direcciones: por un lado, porque están abiertas a la participación ciudadana en las tareas de gestión y programación de los contenidos; y, por otro, porque sus prácticas descentralizadas constituyen un laboratorio de creatividad periodística que, a su vez, está vinculado al devenir de los movimientos sociales y otras formaciones de la ciudadanía organizada (ONG, asociaciones, etc.). La presente investigación ha permitido avanzar en el conocimiento empírico de la implicación de los jóvenes de entre 18 y 35 años en los medios comunitarios, libres y universitarios del contexto español. El estudio analiza las motivaciones y los roles desempeñados por la juventud, así como los procesos de enseñanza/aprendizaje que acontecen en su seno. Se ha observado que la juventud participa en estos proyectos motivada por un anhelo de transmitir contenidos alternativos en un espacio de libertad y creatividad, que contrasta con la desafección que manifiestan con respecto a los medios convencionales, tal y como revelan este y otros estudios (Centro Reina sobre Adolescencia y Juventud, 2014). Así mismo, los jóvenes se acercan a estos medios no solo porque encuentran allí un espacio donde volcar sus inquietudes y demandas, sino porque los consideran un instrumento esencial para la participación en la vida pública. A pesar de los escasos recursos financieros, la falta de amparo legal e institucional y la situación de inseguridad legal (Meda, 2015), los medios del tercer sector (y muy especialmente, radios y televisiones) han logrado implementar procesos formativos que transfieren las competencias necesarias para el ejercicio activo del derecho a la comunicación y, particularmente, para la adquisición de conocimientos teóricos, habilidades técnicas (producción, locución, realización técnica) y de gestión de tecnologías de la información: redes sociales, webs, emisiones «online», etc. No obstante, este estudio evidencia diferencias en las fórmulas con las que los distintos medios desempeñan esta labor educomunicadora: desde aquellos que cuentan con talleres formalizados para la implementación de distintas competencias –el caso de las radios universitarias y de algunas emisoras comunitarias (ejemplo: Unión de Radios Libres y Comunitarias de Madrid-URCM, Onda Merlín Comunitaria y Radio Vallekas en Madrid, CUAC FM en A Coruña, etc. )–, a los que carecen por completo de programas formativos. Estas limitaciones podrían suplirse, en parte, fortaleciendo las sinergias con una comunidad educativa (de primaria, secundaria, formación profesional, universidades) que, por el momento, no se ha implicado de lleno en el desarrollo del sector. En coincidencia con estudios previos (Lewis, 2008), los resultados demuestran que la participación activa en un medio comunitario favorece el desarrollo de competencias interpersonales, sociales y cívicas. No obstante, los medios alternativos españoles deberían ser más ambiciosos en la instrumentalización y planificación de sus planes formativos, tal y como vienen haciendo algunos de sus colegas europeos (Lucas, 2014; Scifo, 2009) y latinoamericanos (Kevjal, 2006; Prieto & Van-de-Pool, 2006). Asimismo, es recomendable orientar estos planes hacia la adquisición de los conocimientos y habilidades necesarias para garantizar la sostenibilidad –social, política y financiera– de los proyectos y, en especial, competencias para la creación de contenidos audiovisuales, para la coordinación y gestión del medio, y competencias tecnológicas (Lema-Blanco, 2015). Es igualmente recomendable que este aprendizaje evolucione desde el actual enfoque pragmático hacia saberes más holísticos y relacionados con el papel de los medios como facilitadores de empoderamiento y cambio social (Kaplún, 1983; Gumucio & Tufte, 2006) y cuestiones teóricas sobre la filosofía, misión y valores de los medios del tercer sector. Todo esto contribuirá además a la construcción de un discurso consistente de cambio, como un factor que contribuye al fortalecimiento y el reconocimiento institucional del sector (Lewis, 2014). Finalmente, concordamos con Fedorov y Levitskaya (2015) en que la definición de las competencias mediáticas de la ciudadanía debería contar con una participación amplia no solo de la comunidad académica, profesionales y expertos, sino también de las organizaciones sociales (ONG, movimientos, etc.) y, en particular, del propio tercer sector de la comunicación. El presente estudio demuestra las enormes posibilidades educativas de estos medios que, aún en proceso de consolidación, parecen ganar posiciones tanto en las agendas académicas (Barranquero & Rosique, 2014) como en las políticas de comunicación de varios estados europeos y latinoamericanos (Meda, 2015). La percepción pública del riesgo ambiental en Europa, un estudio comparado. En 2015, el Grupo de Investigación Persona Ambiente, del que formo parte, participamos en la elaboración de un estudio comparativo sobre la percepción del riesgo en Europa titulado “Survey on public perceptions of environmental risks”. El objeto de este estudio es comprender las diferencias entre la percepción pública y la evaluación científica de los riesgos ambientales y los principales factores que influyen en la evolución de las perspectivas públicas en Europa. El proyecto utilizó un enfoque de investigación metodología mixta, que incluye una encuesta de expertos y grupos de discusión con los miembros del público. Los resultados muestran que, en general, los riesgos ambientales percibidos por el público como merecedores de la más alta preocupación son similares a los riesgos principales identificados por los expertos. Sin embargo, destaca la diferente percepción de los hábitos de consumo, señalados como de gran relevancia por los expertos, pero que en general se valoraron mucho más bajo por todos los grupos de enfoque. Respecto de los residuos, un tema de preocupación para los agentes públicos, sin embargo no han sido clasificados como de alto por los expertos. Dentro de los factores que influyen en la percepción de riesgo del público se incluyen la identidad individual, los sistemas culturales, institucionales y socio-políticos colectivos, los valores sociales y el grado de confianza en las autoridades. El estudio también identificó una serie de características cualitativas de los riesgos ambientales que influyen en muchos aspectos de las evaluaciones de riesgos ambientales por parte del público general: factores tales como la magnitud y la gravedad, la proximidad y el control personal. Las discusiones de los grupos focales mostraron que muchas personas emplean múltiples fuentes de información para comprender cuestiones ambientales a menudo complejas . 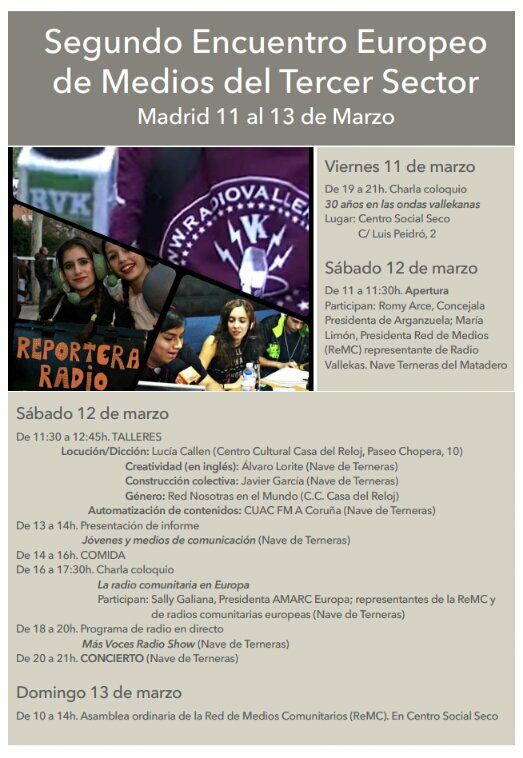 Un elenco de investigadores que forman parte del proyecto “Jóvenes y Tercer Sector de la Comunicación” participarán este sábado 12 de marzo en el II Encuentro Europeo de Medios del Tercer Sector, que organizan en Madrid la URCM, Radio Vallekas y Onda Merlín Comunitaria. Nuestro objetivo es presentar a los comunicadores y activistas radiofónicos participantes en el Encuentro, los resultados obtenidos en el proyecto de investigación, en el que participaron 94 medios del tercer sector y cerca de 50 radios libres y comunitarias. La sesión de retorno consistirá en un coloquio titulado “Alianzas entre la Universidad y los Medios Comunitarios. Una agenda para la investigación-acción”, que celebraremos este sábado 12 de marzo a la 13 h. en Matadero http://www.mataderomadrid.org/ (Plaza de Legazpi, 8. 28045 Madrid). Alejandro Barranquero, Isabel Lema, Gloria Rosique, Eduardo Rodríguez,Griselda Vilar y Javier García, investigadores del proyecto, discutirán los principales resultados del proyecto, presentarán a los asistentes el “mapa online interactivo” del Tercer Sector de la Comunicación y debatirán futuras líneas de investigación-acción que puedan desarrollarse en colaboración con los medios del tercer sector o que contribuyan a fortalecer el sector de la comunicación social. En el coloquio nos acompañarán asimismo tres investigadores que trabajan en distintas áreas del mismo fenómeno: Concha Mateos (URJC, videoactivismo), Ángel Barbas (UNED, medios del 15M) y Josemi Pérez (UCM, radios libres). ¿Cómo participan los jóvenes en los medios del Tercer Sector? El pasado mes de enero se publicó el informe de resultados del proyecto de investigación “Los jóvenes y el Tercer Sector de la Comunicación”, en el que hemos participado 13 jóvenes investigadoras/es de universidades de todo el Estado. Los autores hemos analizado el estado del tercer sector de la comunicación en España, a través de una encuesta realizada a 94 medios de comunicación (radios, televisiones y prensa online) alternativos, comunitarios, libres o educativos. La investigación se complementa con un análisis cualitativo de la percepción de los jóvenes sobre los medios comunitarios, realizado a través de técnicas de Grupos Focales celebrados en 4 comunidades autónomas diferentes y en los que participaron 28 jóvenes de todo el Estado. La publicación, titulada “La juventud española y los medios del Tercer Sector de la Comunicación” analiza dimensiones como el grado de participación juvenil en los medios comunitarios/del tercer sector, el tipo de colaboración y contenidos comunicativos más comunes (programas/secciones) y enfoques juveniles, el impacto social del tercer sector y su grado de profesionalización. Especialmente, quiero resaltar el enfoque educomunicativo del capítulo 4 del estudio, que analiza los procesos de formación mediática implementados en los medios comunitarios- principalmente por las radios libres y comunitarias- (cap. 4.1) y el aprendizaje percibido por los jóvenes que participan en dichos medios (cap. 4.2). El análisis de los grupos focales nos ha permitido conocer el rol que las radios del tercer sector desempeñan en los procesos de alfabetización mediática y las lagunas que se pueden dilucidar de esta práctica no sistematizada. Por ello, los autores han incluído una serie de recomendaciones y propuestas formativas orientadas a la mejora e innovación de los proyectos de comunicación ciudadana (cap. 4.3).